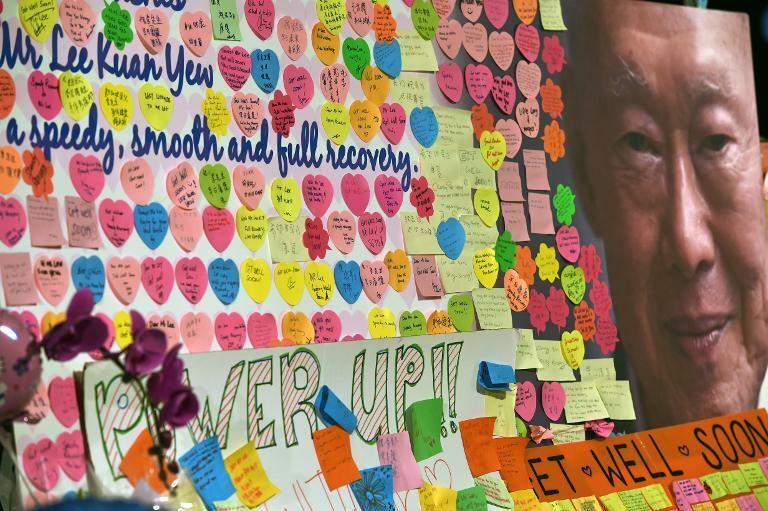 Singapore was plunged into mourning and world leaders united in tribute Monday after the death of Lee Kuan Yew, the iron-fisted politician who transformed a colonial backwater into a world financial centre. His son, Prime Minister Lee Hsien Loong, issued a statement before dawn announcing the passing of his 91-year-old father at Singapore General Hospital following a long illness. "He fought for our independence, built a nation where there was none, and made us proud to be Singaporeans. We won't see another like him," he said in an emotional TV address. Local media reported that more than 11,000 people turned up at the main gate of the Istana state complex to get condolence cards -- with many leaving flowers -- as a private family wake began inside the former British colonial headquarters. Lee's coffin will be transported Wednesday atop a ceremonial gun carriage to Parliament House, where it will lie in state for the public to pay respects until his state funeral and cremation on Sunday. US President Barack Obama, who called Lee "a true giant of history", led foreign leaders in hailing the man who turned a tiny territory lacking natural resources into a world player in finance, trading, high-tech industries and shipping -- all the while exerting a tight political grip long decried by rights campaigners. Lee's blend of economic reform allied with political authoritarianism was of particular appeal to communist China as it opened up in the early 1980s. President Xi Jinping praised Lee as an "old friend of the Chinese people" and said he was "widely respected by the international community as a strategist and a statesman". Tearful mother Sharon Tan, 39, and her five-year-old son Ryan Mackay were among the first to arrive outside the Istana. "I brought Ryan here to share an important part of Singapore's history to him and also to help him understand why mummy is so sad," she said. Lee, whose health rapidly worsened after his wife of 63 years, Kwa Geok Choo, died in 2010, was in hospital for nearly seven weeks with severe pneumonia. Despite growing anticipation of his death, sales manager June Tay Mae Sann, 37, said "it was still very different when it happened". Lee served as prime minister from 1959, when Britain granted self-rule, to 1990. 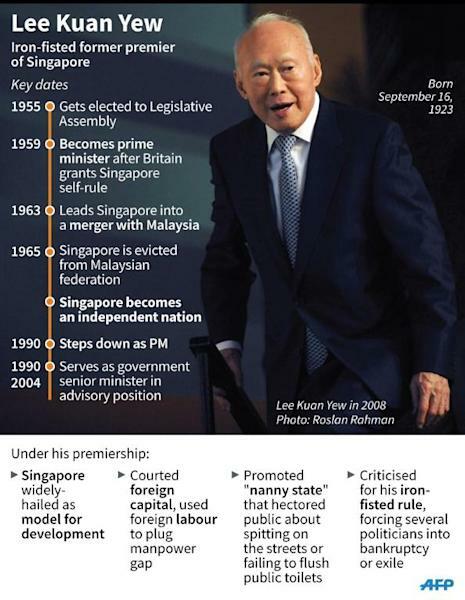 He led Singapore to independence in 1965 after a brief and stormy union with Malaysia. Singapore now has one of the world's highest per capita incomes and its residents enjoy near-universal home ownership, low crime rates and first-class infrastructure. The opposition Workers' Party, whose leaders were among those harried for years by Lee, joined the rest of the nation of 5.5 million in mourning him. On the diplomatic front, Lee's counsel was often sought by Western leaders, particularly on China as well as on more volatile neighbours in Southeast Asia. 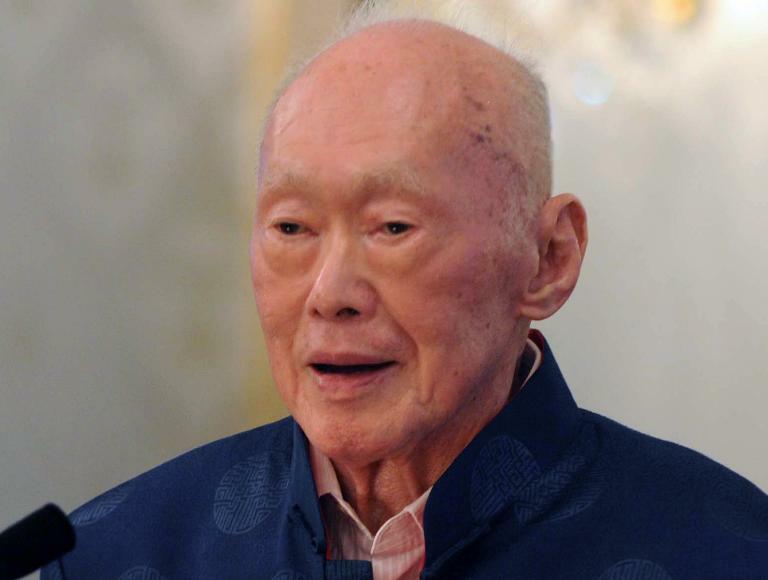 "Lee Kuan Yew gave Singapore an international profile completely disproportionate to the country's size," political analyst Derek da Cunha told AFP. But the Cambridge-educated lawyer was also criticised for jailing political opponents and driving his critics to self-imposed exile or financial ruin as a result of costly libel suits. Singapore strictly controls freedom of speech and assembly. While it has become more liberal in recent years, it still uses corporal and capital punishment and ranks 150th in the annual press freedom ranking of Reporters Without Borders -- below Russia and Zimbabwe among others. Phil Robertson, deputy Asia director of Human Rights Watch, acknowledged Lee's economic legacy but said "it also came at a significant cost for human rights". He said it may now be time for a national "conversation" on greater political liberalisation. In a sign that things may not change soon, the government Monday designated Singapore's only free-speech zone, known as Speakers' Corner, as a place for honouring Lee. Permits for protests and other gatherings will not be granted in the meantime. Lee stepped down in 1990 in favour of his deputy Goh Chok Tong, who in turn handed the reins to the former leader's eldest son Lee Hsien Loong in 2004. The People's Action Party (PAP), co-founded by the elder Lee, has won every election since 1959 and holds 80 of the 87 seats in parliament. Lee retired from advisory roles in government in 2011 after the PAP suffered its worst poll result since it came to power, getting only 60 percent of votes amid public anger over a large influx of immigrants, the rising cost of living, urban congestion and insufficient supply of public housing. In his last book "One Man's View of the World" published in 2013, Lee looked back at his career and concluded: "As for me, I have done what I had wanted to, to the best of my ability. I am satisfied."